Interesting note, Bandcamp provides the listener the opportunity to hear the songs in their entirety for free, and we think that that is a wonderful idea may someone be interested in purchasing his recordings or simply taking the time to listen and enjoy something new. 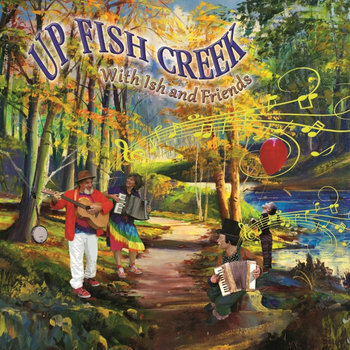 Up Fish Creek is a wonderfully produced CD recording that was specifically written, arranged and produced to appeal to All Ages. For it offers a delightful mix of upbeat positive themes and varied musical styles that bounce around from Folk, Bluegrass to Rock-Grass and the Blues. The thoughtfully written themes encompass topics we all can relate too; from love won and lost, to appreciating kindness and consideration, the joys of friendship and family, to caring for the environment. While some deal with life’s inescapable challenges, but still carry messages of hope and joy. We also decided to take a leap of faith and to share with you four delightfully arranged Instrumentals blended in amongst the songs, that we hope will set your imagination free as you discover a new and charming aspect of our music. Starting off with the title track, Up Fish Creek; it’s a high octane Instrumental mix of Louisiana Swing and Celtic-like influences; intended to ignite your imaginative spirit and inspire you to get up and dance. There are also two beautifully arranged European flavored Instrumentals featuring Accordion & Melodica. We have also included a Celtic like Jig featuring clawhammer banjo, violin, penny whistles, flutes and wooden spoons. This Instrumental will have you tapping your feet, hugging the ones you love and dancing uncontrollably. With that in mind, imagine going to a wonderful music festival in the park and discovering that there is something here for everyone - young and old alike, and, everyone is having fun, as you wander from stage to stage. And, or, maybe you might just find a picnic table under a shady tree, by the creek, hang out and have your lunch, enjoy the music, and have some fun. We hope you enjoy listening to Up Fish Creek, and find it in your heart to play them for your family and friends, young and old alike. "Never Say Never” is Ish’s (2nd) Children’s CD and was produced with the same love and attention for fun and detail as his first Children's CD, Cardboard Wings. Never Say Never was nominated as Children's Recording of the Year, 2012, by the Western Canadian Music Awards. The fourteen songs on this CD paint positive messages amid all the fun and feature different musical styles, off the wall sound effects, character voices, special musical guests and joyful children singing along and having fun. Ish's style is best described as a combination of imaginative and thoughtfully conceived storytelling lyrics played in a folk, blues, bluegrass, soft rock and country genre. For this recording he decided to mix it up culturally by including some wonderfully talented new musical friends and throw in some, jug-band, jazz and old-timey claw-hammer banjo influences as well as some polka-circus-rock. He also included some beautiful three part harmonies, showcasing a few delightful duets with some children sharing the microphone. The incredible Kamloops Thompson Children's Choir. Take a listen, you'll be pleasantly surprised. 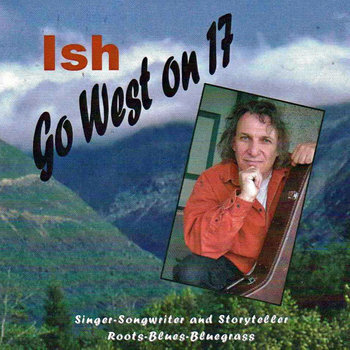 Ish’s (debut) CD for Grown-ups, "Go West on 17" comprises of twelve original songs. Plus a unique reggae-blues arrangement of Eric Burdon & the Animals big hit, "Misunderstood." Ish's style is best classified as a combination of delightful and thoughtfully conceived storytelling lyrics played in a folk, blues, bluegrass, soft rock and country genre. Ish’s themes gracefully bounce around from love won and lost, to parenthood, contemporary social issues, life’s challenges, and of course, messages of hope and joy. With that in mind, he decided it was time to share his thoughts and musical aspirations beyond the context in which he is best known. Take a listen, you will be pleasantly surprised. 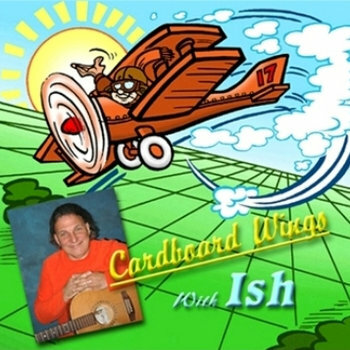 "Cardboard Wings" is Ish’s (1st ) Children's CD. Ish's (10 ) family friendly songs and stories on this CD paint a positive message amid all the fun and feature different musical styles, off the wall sound effects, character voices, special musical guests and lots of joyful children singing along and having fun. However, for this recording he decided to mix it up culturally by including some wonderfully talented new musical friends and throw in some jazz influences as well as some off the wall polka-circus-rock. "Cardboard Wings" was originally produced in 1994 and released as a cassette. In 2003 (1) song from the original cassette release was replaced with a new song that was added to the CD mix. It was then re-mastered and the CD cover art was created by the talented Cartoonist and Illustrator, Harold Duckett. Special Thanks to: The amazing Glen Park Public School Choir.